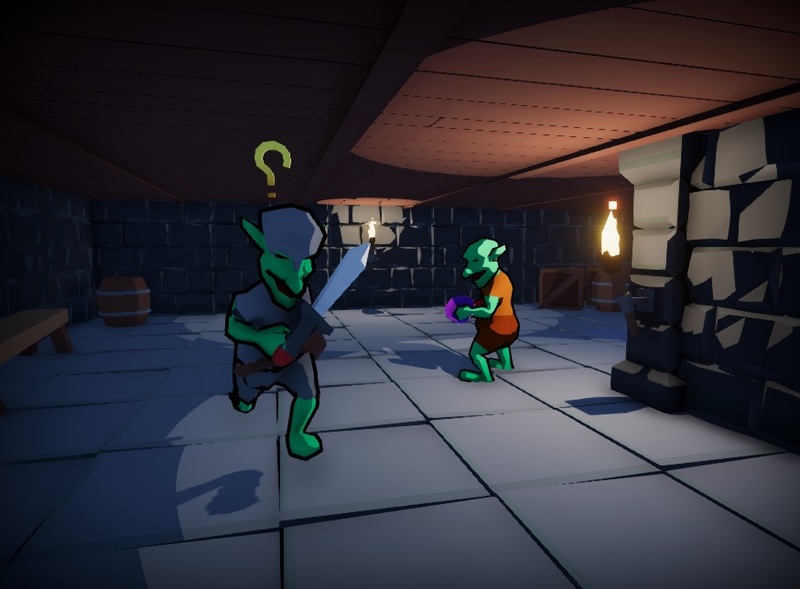 Dungeon of the Goblin King is a 3D turn based roguelike that focuses on stealth mechanics. The game was developed during the 7 day roguelike challenge 2019. The game can be played in browser, but it is highly recommended to download the desktop version to get the intended visual experience. The Goblin King has captured you and left you to rot in his prison. Luckily they forgot to lock your cell door. 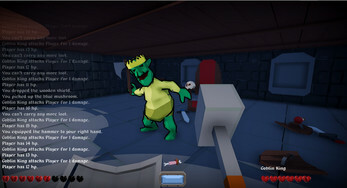 You have decided to get your revenge by killing the King and escaping the goblin fortress. 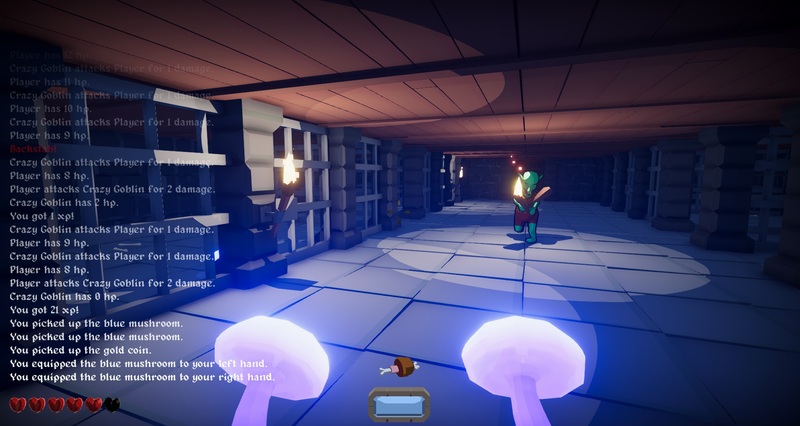 You can extinguish light sources to remain hidden, throw items to distract guards and then backstab them. The game is turn based. Use mouse to look and WASD or arrow keys to move. 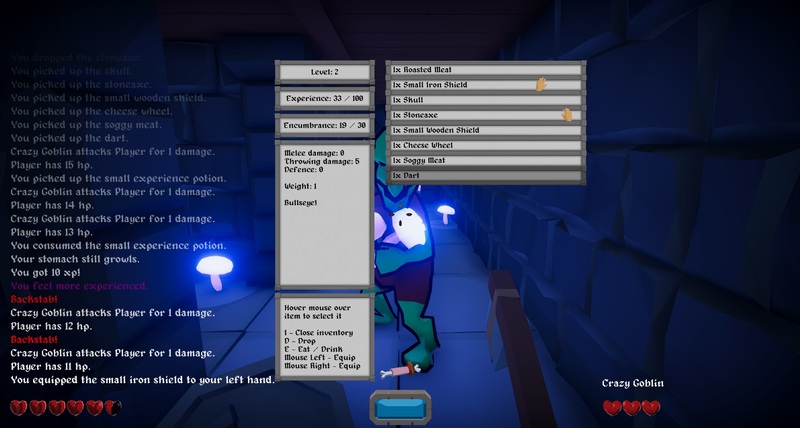 You can attack creatures by moving towards them. 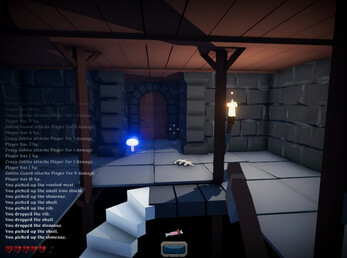 You can interact with objects by pressing space. After gaining enough experience points, you level up and get a perk point. Perk points can be used to buy various upgrades. The blue gem at the botton shows how visible you are and the piece of meat represents your hunger. Once the meat is gone, you are starving. You can equip any item in either hand. 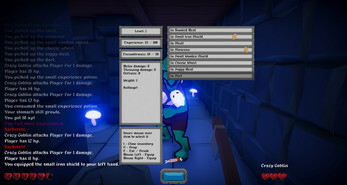 Using two weapons instead of shields gives you better damage, but leaves you vulnerable to enemy attacks. Some weapons do better damage when thrown. Moving towards an impassable object for one second allows you to peek over it, which makes picking up items easier. I have just seen a video of this nice game on the channel of Rogueliker. Just spent the last hour or two playing and had a great time. Thanks for sharing! Did you try pressing spacebar while looking at the cell door? Enjoyable. I would definitely recommend this game. The mechanics are simple (albeit a little tricky at first) and combat surprisingly fluid for a turn based game. I definitely enjoyed what I have seen of it so far and hope that this project gets updated (even though you could already call it finished. Keep it up Teamkalamakkara!